Anyone can volunteer! Volunteers must be 18 or older to volunteer during activities that include direct client contact. Teenagers between 16-18 may volunteer without adult supervision during non-client events. Those younger than 16 may volunteer with adult supervision during non-client events. What is our policy on court-ordered community service? Currently, our policy is that we cannot accept volunteers requiring court-ordered community service hours. Start by attending a volunteer information session and completing required paperwork. Please email the Volunteer Coordinator at: volunteer@loavesfishespantry.org if you are interested in attending a New Volunteer Information Session. When are new volunteer information sessions held? To learn more, please email the Volunteer Coordinator at: volunteer@loavesfishespantry.org. What kinds of jobs can be done by volunteers? The Pantry has many needs, both during Open Pantry sessions and in-between. 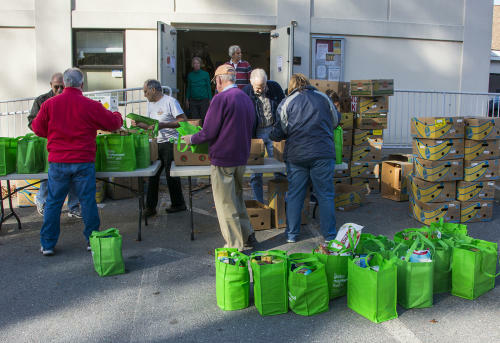 Volunteer opportunities during Open Pantry sessions include sorting donated food, stocking shelves, helping clients shop for groceries, greeting clients, and driving to pick up donations. Other volunteer activities include weekly evening stocking sessions, helping out during special events or serving on a committee. All time and talents offered are put to good use. Do I need to commit to a minimum number of volunteer hours each week/month/year? Whether once a year or once a week, there’s a volunteer opportunity for you. There is no minimum commitment and we are happy to have you join us whenever your schedule permits. Can I volunteer if I am a client receiving food? Yes, during specially arranged activities.